Please contribute to the ongoing discussion on these themes by sharing with us your impressions of the exhibition. Any suggestions would also be appreciated. Take this opportunity to get in touch with the mathematicians involved in the project! 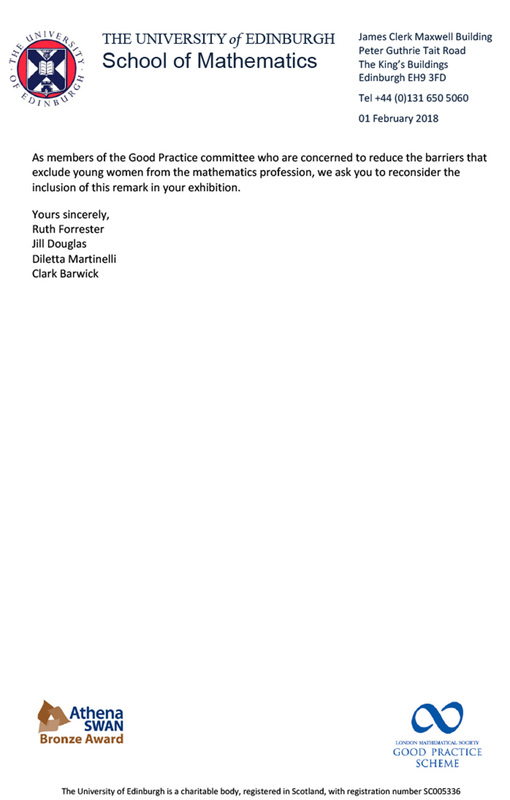 We are posting two mails plus the original letter as PDF we received from the Good Practice Committee of the School of Mathematics of the University of Edinburgh and the International Centre for Mathematical Sciences in February 2018, expressing some concern about the contents of the exhibition. We also add the answer of the curator of our exhibition, Sylvie Paycha). We have had the exhibit “Women of mathematics throughout Europe” on display at ICMS in Edinburgh for the past year. We had received a lot of very positive comments about the exhibit and have also had the pleasure of meeting a few of the women featured on the portraits at our workshops. The people who have approached me have indicated that they think this is insulting to women mathematicians and contradicts the exhibitions intentions to portray thirteen women as role models for young scientists. I would be interested to know why this panel was included as the sentiments expressed by Oksana Yamikova are not encouraging. At a recent workshop held at ICMS in Edinburgh it was good to see the “Women of mathematics throughout Europe” exhibition. Unfortunately, however one remark featured there has caused some concern which was raised at the subsequent meeting of the Good Practice committee. I attach a letter from members of the committee, which we ask you to consider. PS We do appreciate that you have gone to considerable trouble to create this exhibition – which in general has excellent aims that we would support! Dear Alice, Thank you for reporting on this issue; let me forward to you the reply I sent Ruth Forrester telling her that we plan to post the letter she sent us up on the webpage of the exhibition, probably under the “Edinburgh” venue. Thanks again for bringing this issue up to our attention. 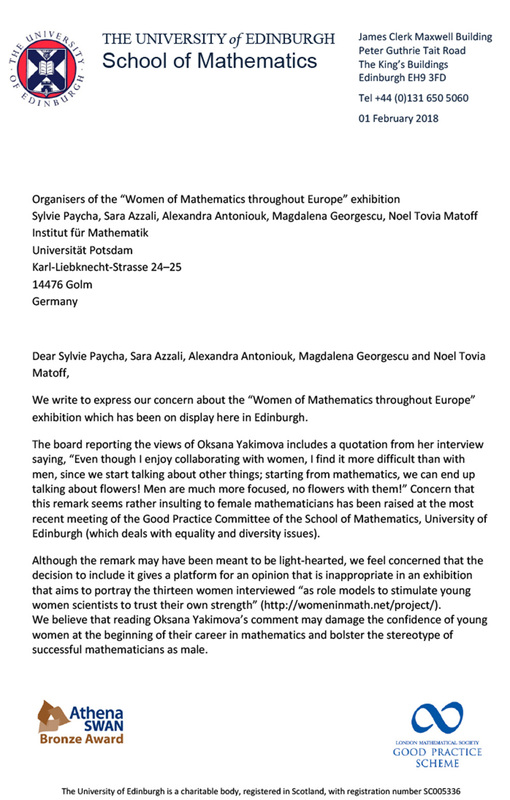 Thank you for your feed back concerning the exhibition “Women of mathematics throughout Europe” exhibition. We plan to post your letter up on the webpage of the exhibition, probably under the “Edinburgh” venue. I fully agree with you that Oksana’s assertion “Even though I enjoy collaborating with women, I find it more difficult than with men, since we start talking about other things; starting from mathematics, we can end up talking about flowers! Men are much more focused, no flowers with them!” should be questioned. As curators of the exhibition, we were also concerned by Oksana’s point of view but we didn’t feel it was our role to censure her. Bringing this sentence out to the forefront with a quote on a panel is a way to open up the subject to discussion. Thanks for bringing this issue up to our attention. We are very happy to welcome you to share your impressions with us. Building up the exhibition, which took us two years or so, was a very exciting and rather unique experience. We do hope you enjoy seeing it and are looking forward to your feedback! I wonder if you have any kind of communication or follow ups with women mathematician outside European zone!! In particular, that now an Iranian woman had won a fields medal (Maryam Mirzakhani)! Is the gallery of portraits available for viewing on line? I can’t find it. Dear Tangora, no, you can either see the portraits in the exhibition or in the catalogue, which you can order here: http://www.verlag-am-fluss.de/. The catalogue “WOMEN OF MATHEMATICS THROUGHOUT EUROPE, A gallery of portraits” is an essential part of the project and complementary to the exhibition. It encompasses the 13 complete interviews from which the excerpts presented on the exhibition panels were extracted. Is the catalogue available only on Verlag-am-fluss web site? Can I buy it directly at the exhibition in Rome? Dear Enrico, sorry for answering late – hoepfully you could join the opening in Rome yesterday – and were able to buy a catalogue? That would have been my answer, yes, you can buy the catalogue directly at the exhibition.